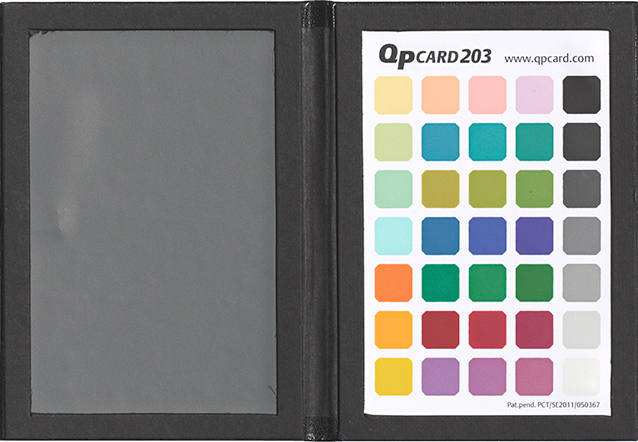 The QPcard 202 and 203 are color charts for calibrating and profiling digital cameras. The QPcard 202/203 consists of 35 ink patches applied to a paper substrate in 5 rows of 7 patches. There are 9 primary colors, 12 secondary colors, 7 pastel colors and a 7 step grayscale. The QPcard 202 is 170 x 240 mm (6.7 x 9.5 in.). The QPcard 203 is a smaller version of the QPcard 202, at 90 x 130 mm (3.5 x 5.1 in.). The QPcard 203 is also offered as the QPcard 203 book, which includes an 18% gray card with both cards mounted in a booklet format about the same size as a passport, 95 x 135 mm (3.75 x 5.3 in.). The book has a ribbon attached under the gray card to be used for hanging or attaching the book in the scene. An elasticized band is attached to the book's outside for securing the book closed. The ink appears to be silk screen printed onto the substrate. The paper substrate contains a fluorescent brightener but it does not appear to effect the patches. The paper substrate is not opaque, making the choice of the backing very important since it can be expected to influence the patches. Two charts were measured and averaged for the table data. The measurements were made with an X-Rite i1Pro. The spectral data was acquired, averaged and analyzed with SpectraShop™ 4. All items on this website are Copyright © 2002-2018 Robin D. Myers, all rights reserved worldwide.